The Selvin lab has recently made small quantum dots (<10nm diameter) that are extremely bright and photostable, enabling single molecule detection of specifically labeled receptor proteins in cultured living neurons. These small quantum dots were successfully used to label AMPA- receptors and anchoring proteins for synapse localization. The report, Cai, et al., 2014, shows receptors are primarily in the synapse and that long-range extra-synaptic diffusion into the synapses is not of primary importance. The quantum dots were visualized in three-dimensions with new computer aided design by the Schulten group. 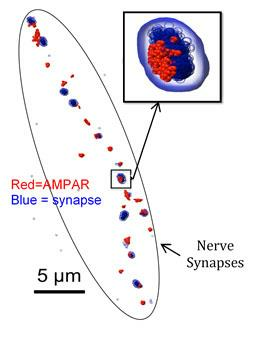 The researchers find that once inside the synapse, the receptors surprisingly diffuse around in nanodomains, with the nanodomains themselves diffusing about 10x slower. Occasionally, AMPA-receptors endocytose into the cell and travel from one synapse to another via microtubule-assisted transport. In a separate study, Wang, et al. 2014, small antibodies were used to label neural receptors, ensuring that the prior results with small quantum dots are real and not caused by the size of the label.